Ashtar Command Book Blog : Have you ever enslaved a population? "The Road to Xenu" is a kind of novel exposing the machinations of Scientology, a new religious movement often accused of being a dangerous cult. The author, Margery Wakefield, was a committed Scientologist for 12 years. She recently obtained her own channel on Youtube, with a lot of interesting information. I believe she is currently a Christian. 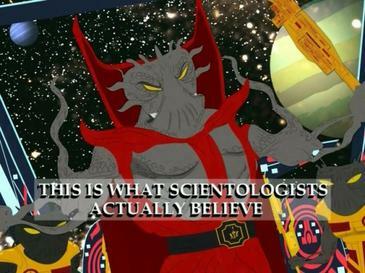 "The Road to Xenu" is also available free of charge on the web. The book isn't Wakefield's real autobiography, but a fictionalized account based on the experiences of both herself and others. Her real biography is called "Testimony", available on the web. Although Xenu has almost become a culture icon these days, most of the book deals with other things: the brain-washing techniques, bizarre drills, the mistreatment of children, recruitment of teenagers (who sometimes get responsible posts in the repressive apparatus of the cult), the near-incomprehensible ideas of Scientology founder Hubbard, etc. Scientology hooks people by promising to cure them from their real or imagined ailments, but the reality behind the façade is grim. The cult even has its own prisons, uses its members as cheap labour, and cons them out of their money and savings. In return, people are promised a "bridge to total freedom", which turns out to be a never-ending round of bizarre "auditings", during which members relive their past lives, sometimes on other planets, with the help of a machine known as the E-meter (really a kind of lie detector). Everyone who fails, snaps or questions the procedures can be punished or expelled. Defectors are systematically harassed, and Wakefield even claims that the Scientologists seriously considered assassinating two particularly dangerous adversaries, Paulette Cooper and Michael Meisner. Both the imaginary hero of "The Road to Xenu" and the real Margery Wakefield of "Testimony" get into trouble because they simply can't believe the rubbish about Xenu, the Galactic Federation and the volcanoes. Since this esoteric doctrine is only communicated at a high level of the cult, those who learn it may have waited for years and spent considerable sums of money in the process. Small wonder people feel conned (and perhaps snap) if they can't make themselves believe it! One thing that struck me when reading the novel, is that Scientologists do have some kind of "spiritual" experiences. The most obvious is seeing your past lives during "auditing". Others are harder to pin down: a sense of floating, the healing of psychosomatic ills, flashes of sudden insight. Wakefield had several experiences of seeing the world in more vivid colours, similar to what happened when she experimented with drugs. It's also possible that some people on the higher levels learn astral travel - after all, more legitimate spiritual groups can teach you similar things. These results (or "results") might be one reason why Scientology can keep its members, but mostly it seems to be the repression and brain-washing that does the trick. Wakefield points out that many of the techniques used to "audit" others, work just as well to discipline and manipulate the person carrying them out. At least during the 1970's, when the story is set, many new recruits were very young, some being children to Scientology couples. This could also explain part of the success of this bizarre "religion". Of course, the idealism and unfortunate gullibility of the period might have done its work, too. "The Road to Xenu" is both well-written and interesting, and almost make you feel the weird and claustrophobic atmosphere of this particular organization. I hope it can save at least some people from being enslaved by Scientology.